Okay, these are not something I'm going to snack on ever day, but, what a tasty treat! Gotta let yourself indulge once in awhile! Right? 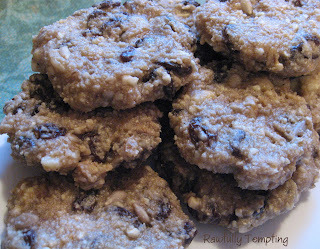 They are also a great dessert to make for non-raw foodies who would probably never know they are raw! You all know how much I LOVE *Medicine Flower raw, organic extracts. Feel free to use whichever vanilla extract you like, but I swear the combination of the maple syrup and the MF vanilla, makes these cookies taste like they were made with BUTTER!!! What flavor!!! Sprouted oat flour, almond flour, cashews, your favorite sweetener, sea salt. Dehydrate at 110 degrees 8 - 10 hours. Cookies should be dry, but chewy. Store in airtight container in refrigerator or freezer. The link is for hulless oats, which are grown without hulls and are sproutable. When manufacturers try to remove hulls, they destroy the oat and make them unsproutable. If you have to use any other oats, use oat groats. They probably won't sprout because they are no longer alive, but can work in a pinch. For non raw oat groats, soak them for an hour or two, no longer. Drain well and spread on a non-stick dehydrator sheet and dehydrate at 110 degrees overnight. Use a nut seed or coffee grinder and grind into a fine powder. 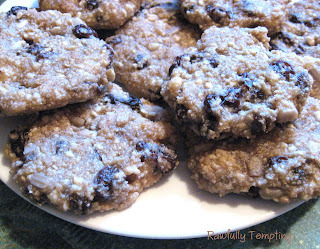 Rawfully Tempting Oatmeal Raisin Cookies are available at my online cafe. *Mention Rawfully Tempting in "Shipping Comments" and Medicine Flower will include a Special Bonus Sample with any purchase. Those do sound good--and decadent! For me, though, 'made with butter' isn't a compliment: I'm the only person I know who really hates butter with a passion. I actually hate the taste of it, aside from the fact that it makes me ill. Weird, huh? I haven't tried gluten-free oats, but haven't had good experience with oats in general, but I can definitely imagine making these for oat-loving family members. And I adore medicine flower's products too! Hi all, I'm new to Raw Food and don't have access to a dehydrator. Is it possible to use a low heat in an oven to achieve a similar result? It sounds delicious! I've been told that you can, however, it's not every economical, and most ovens dont' go below 170 degrees, so you have to leave the door open, and sometimes turn the oven off and I have no idea how long it would actually take...but, they say it can be done...!!! If you try, let us know...I don't know anyone who's actually done it, other than comments I've read. These look absolutely delish!! They look just like the cooked versions. LOVEEELYYYY. glad i found your blog!